Wired or analog dictation devices are still considered by many to be the best choice to create instantaneous digital documentation. 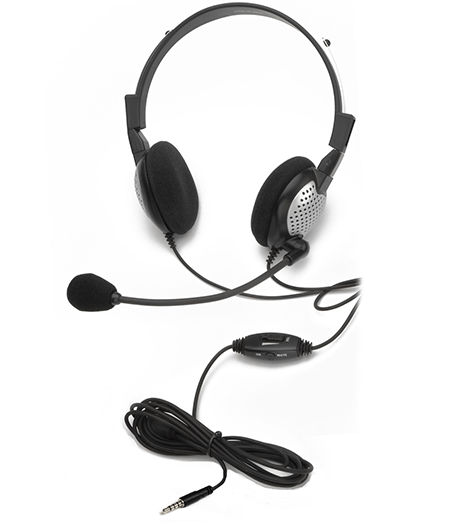 Quality is everything when it comes to choosing a dictation device so Certified eSupport offers you support on the highest quality wired headsets from Andrea Communications and VXi. If you choose to make the switch to one of their USB or Bluetooth headsets, we can give you the technical support you need to make a seamless transition to an upgraded dictation device. This cost-effective wired headset delivers high quality recordings thanks to a proprietary noise-cancelling microphone. The Pro-flex wire boom on the reversible headset makes it comfortable for any user and it conveniently has in-line volume and mute controls. This dictation device is an excellent choice for high-volume call centers and larger office environments. It has been awarded the 6 Dragon® rating by Nuance so it pairs seamlessly with Dragon speech-recognition software. Certified eSupport can show you just how easy it is to integrate this dictation device into your workflow and streamline your workflows instantly. These wired headsets come in both monaural and binaural options, both of which deliver superior sound quality and natural sounding wideband audio. Whether you need to keep one ear free to be open to conversation around you or would prefer to block out the distractions around the office, VXi has a wired headset for you. Designed for comfort and wearability, VXi headsets make streamlining your unified communications easy. If you want a Bluetooth dictation device, the VXi BlueParrott B250XT is a revolutionary piece of dictation technology. Whatever your choice is, Certified eSupport can help you install and implement the dictation device that suits the needs of you and your company.